The technology that we see today in an evaporative air cooler is not entirely a new idea. Before the invention of air conditioning or air coolers, people used to handle hot summer nights by sleeping outside on screened-in porches. They would hang wet sheets inside the screened panes, and as the warm air passed through the screen, it would be cooled by the wet sheets. That cooler air would circulate slowly, cooling the sleeping area and easing the suffering that summer nights could cause. Today we have the technology to cool our indoors sleeping and living quarters much more effectively, but one of these technologies, the air cooler, works very effectively on a similar principle as the one employed by those earlier cooing attempts. Evaporation happens in nature all the time. It is the way that our bodies cool themselves by the process of sweat evaporating off of the skin. You’ll notice the effects of natural evaporative cooling near bodies of water as a cool breeze comes off the water, especially in areas with hotter, drier air. As the dry air passes over the water, the air will absorb some of the water and become cooler because heat naturally tries to equalize itself. Meaning that when a hotter and cooler material intersect, the nature of thermodynamics is that the 2 materials will transfer heat until they are the same temperature. So, as the air meets the water, some of the heat moves from the hotter air to the cooler water, leaving the evaporative cooler than it was. A cooler simply puts this natural event to regular use in a machine that will efficiently and effectively cool your home or office. But the best evaporative coolers don’t just cool the air, they also move it through the room with a fan or blowing system. The cooler pulls fresh hot air from outside through moist pads so that it can pick up water and be cooled by as much as 30 degrees. The pads also have the added advantage of acting as an air purifier or ionizer. That cooler, cleaner air is then blown throughout the room or the building. Because the cooler has to have dry air in order to pick up water and be cooled, evaporative coolers work best in dry, hot climates. But where they do work, they can be much more cost effective than regular air conditioners or other cooling home appliances. Not to mention the fact that they are also better for the environment. You can even find solar-powered evaporative coolers for the truly environmentally concerned. There are sizes with air speeds available for every need, from portable window coolers to high-powered industrial coolers for commercial use. Whatever the need, there is an evaporative cooler to meet it. 1 But What Exactly is a Swamp Cooler? But What Exactly is a Swamp Cooler? A swamp cooler, which is also called evaporative cooler, is a chiller that works by using the heat exchange principles. It can be utilized during the summer months when the temperature is higher and there is a need to cool down the interior of your house or car. In general, this type of cooler is also a closed system much like air conditioners which works by cycling cold water through pipes that are connected to a ventilation system which would be a fan. The fan channels air over the series of pipes that are cooled by the cold water. This results to a cooling effect, which can be used in almost any interior. Evaporative coolers are considered the ideal option to make homes cooler during the hot summer months. If you are spending too much money on a monthly basis to use your air conditioning unit, then you should get one of these coolers. The Champion Wind Evaporative Swamp Cooler is a high quality evaporative window cooling unit that offers supreme cooling efficiency while being extremely energy efficient. One of the great features that this swamp cooler has to offer is that it is made of high end polyester that will help prevent the unit from rusting and corroding over time. Another great quality of this quality swamp cooler is that it features bolted construction which offers easy maintenance for consumers. With the powerful 2800 cubic feet per minute blowing capacity this evaporative cooler offers great power for an affordable price that will quickly lower the temperature by approximately 20-30 degrees depending on the level of humidity in the air. If you are looking for a reliable evaporative swamp cooler, the Champion Wind Evaporative Swamp Cooler is a great option. The SF-608R is made from Sunpentown manufacture. This particular model of portable evaporative cooler is currently one of the best-selling portable coolers in amazon. The reason is because it possesses the best quality with the most affordable price compare to other air cooler devices. The wheels are attached to the bottom of this device, therefore it can move easily from one place to the other. This model can quickly cool the air around up to twelve degrees cooler within a short amount of time. How Does This Portable Swamp Cooler Work? The SF-608R evaporative cooler works by circulating the air. Cool air will be supplied to the room, in a constant manner. If it’s placed near the door, then it will draw the air from the outside. The pads have enough moisture to filter the air and make it cool, as the pads have enough moisture in them. The process of filtration will produce cool air to be circulated. For best results, it’s important to keep the windows open to let the warm air go out of the room. The level of water cannot be controlled, because of the portable nature of an evaporative cooler. However, manual regulation can always be carried out. What Should Be Done to Maintain The Cooler? The cooler might lose its capacity, when the climate gets too hot to handle. That will increase the level of corrosion, resulting in shortening the lifespan of the cooling system. The user needs to ensure that the pads get the moisture, through the continuous supply of water. A filtering unit needs to be there in the portable evaporative cooler, for the wet pads to be accumulated. This filter will also ensure that it restricts the odors from coming inside the office or room. What Are Some of The Issues with This Model? The main issues of this SF-608R cooler are the fact that it doesn’t work great for very humid climate and in large rooms. It is best to use it for dry weather or having little bit of humidity. It is also not wise to use it for big office or large firm’s warehouse. The ideal place to put it is in smaller room and personal space. The Whynter 14000 dual hose portable air conditioner (ARC-14S) is the best option for conditioning the air of the limited space. If you are interested to get the assistance of a well working device that can be mounted in a fix place once, you should select purchasing dual hose portable air conditioner. It’s easy to find the one of your interest in the online store of Amazon for just $440 where you can get 3 % discount at the retail price of this AC. This particular air conditioner model weighs about 96 pounds and features the outstanding performance for cooling the space and offering a reasonable price. It is also one of the best-selling portable air conditioners in Amazon. • The exclusive air conditioner works on trial operational modes. • The remote controlling feature of the device assists the user to adjust the speed and switching on and off the air conditioner with the help of remote controller. • The awesome device is provided with the thermostat unit to help with the digital read out function. • You can enjoy the working of the machine automatically according to the set up time with the assistance of a programmable timer. The Whynter dual hose portable air conditioner (ARC-14S) possesses the capability of 100 pints per day while its fan system runs in three different speeds. Utilizing the variety of functions and settings in the air conditioner, you can adjust the device according to your requirement in the particular situation. You don’t need to mount the air conditioner permanently; thus, there is not any problem of attaching or mounting the machine anywhere in the permanent manner. You just require choosing a suitable spot in your room where you can get water and ventilation. The user friendly digital control works better in the Air Conditioning unit with the help of its remote control. It works well for changing the settings as soon as you get the indication of unbalanced temperature by the thermostat. On the other hand, the built in timer in the AC requires setting only once and it automatically changes the setting throughout the day. Apart from these capacities, the Whynter (ARC-14S) comes with additional utilities such as plastic windows, a carbon air filter and reusable pre filter along with every new air conditioning unit. The extra ordinary air conditioner has been constructed with the latest engineering that declines the requirement of energy in the air conditioning unit along with the maintenance of the performance of the device. The installation of the device is very easy and straight forward as well as the machine is operated without creating any sound. The exclusive dual hose air conditioner excludes the requirement of central air system. The AC unit cools the room rapidly and represents highly effective results. An evaporative cooler is also called a swamp cooler and it will reduce the temperature in the house with an evaporation process using the water that is coming from the machine’s reservoir. Liquid is evaporated by a certain level of heat, which is called latent heat. The swamp or evaporative cooler will draw latent heat from the atmosphere to evaporate the water that is inside the reservoir. You will feel a drop in the temperature as the water starts to evaporate because the action will atomize into tiny droplets that will make the surroundings cooler. Besides the home coolers, you can also find industrial evaporative coolers. The industrial and the home units can be installed on the roof, windows or exterior walls of buildings. The fan would draw air from the surroundings through the vents at the sides and the damp pads in order to cool down the building. The best evaporative coolers will have thick pads as these can hold lots of water to carry out the cooling down process. As opposed to drawing hot air from the inside, an evaporative cooler will take in the hot air and then the wet pads will make it cooler. Based on how the cooler works, it is very important to buy one of the high-quality pads in order for the unit to work effectively. When the pads are thick and are more absorbent, the unit will cool the hot air effectively. 2. 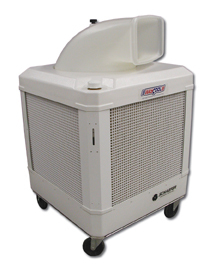 Portable evaporative coolers are available in many sizes and shapes. These are made with wheels on the bottom for portability, so you can buy one of these units to use anywhere inside the house. Apart from that, you can take them to other locations if you have to travel to somewhere that is extremely hot. These coolers come highly recommended if you are looking for way to save money by reducing your cooling expenses. In addition to reducing your utility bills, this cooling method will protect you against harmful chemicals. The unit is not made to use harmful chemicals which are dangerous for you and the environment. Besides the fact that the unit is easy to use, the swamp cooler parts will work to cool the surroundings in a natural way using humidity and heat. Some of the main cooler parts include a blower motor; blower; evaporative pads; screen; recirculation water pump and float valve. Most of the units are made with features that will help to eliminate dust and pollen from the house. So, the cooler will give you the peace of mind to know that you are saving the environment and reducing your electric bill at the same time. 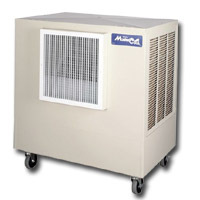 Portable evaporative air coolers are made with special pads to cool and dampen the room. It will work by taking in the hot air and then the wet pads will push it outside to give cool temperatures of 10 to 15 degrees. The evaporative air coolers use a cooling system that will evaporate liquid in the surroundings in order to cool any liquid or object that it come in contact with. Two-stage cooler: This traditional cooling system is also called an indirect cooling system. It will only use a small amount of energy for vapor compression. You should know there is a drawback to using one of these air coolers because they have a tendency to make people uncomfortable as the air will become humid. Cooling towers: These structures are used to cool water and will work like the evaporative cooler system. Generally, these cooling towers are used on tall and large buildings or industrial sites and will work by transferring heat from chillers to the environment. Direct Evaporative Cooler: With one of these home air coolers, the energy in the atmosphere will not change. This is an open circuit system that is used to reduce the temperature by a process of evaporating latent heat to change water to vapor. During this process, warm dry air will be changed to moist and cool air. Indirect Evaporative Cooler: This has similarities to the direct system, but it’s a closed circuit. For this system to work, it needs some kind of heat exchanger. When the air is cool and moist, it will not come in contact with a conditioned atmosphere. Energy efficient: Due to their unique design and the fact that smaller blower motors are needed to cool a home, swamp coolers use 1/4 of the energy used by standard air conditioning units. What does that mean in terms of operating costs? Well, operating costs are incredibly lower, sometimes as much as 80% lower! Cheap to install: Purchase and installation costs run approximately $700 to $1,000. Refreshed Air: Swamp coolers, due to their design, push warm air out of the space through widows slightly ajar. Because of this, the air is freshly recirculated and a complete air change occurs every at least every 3 minutes. Air conditioner units recirculate old air. Swamp coolers also improve the breathability of the air. Works best in dry climates with temperatures above 80° F and humidity below 30%. Hot, wet climates are ill suited as the air is already heavy with humidity and not enough additional water will evaporate to actually make a difference. They are found primarily in the western United States including California, Arizona & New Mexico. Prevalent where sufficient water is available. Because swamp coolers work on the premise of water evaporation to cool the ambient temperature in a room, they need a constant source of fresh water. They draw 3-11 gallons of water per hour. Locations without an ample water source are less likely to use these coolers. Freeze Protection Needed: The water supply line has to be protected against freezing in the winter; therefore, the entire unity has to be drained. The [moist] pads which the air blows need to be changed frequently and the unit itself has to be cleaned periodically. This prevents the buildup of bacteria and mineral deposits. Airborne contaminants may be blown into the building. The system is constantly pulling air from outside to push it over the wet pads. To prevent this possible contamination, special filters would need to be installed. Central air conditioning units offer dehumidification. Because of their design, swamp coolers are unable to dehumidify a room. 1.) Always clean the outside swamp cooler parts. This is an easy task to help extend the life of your unit. Also, it helps to see your cooler very clean when first seen. First, make sure that the unit is turned off before you start wiping it with cloth. Do not use any harsh chemical or detergents when cleaning the outside unit. 2.) Next, inspect the evaporative cooling pads. See if they are still in good condition or need replacing. The pads are usually made in materials that resist mild dew such as the aspen wood shaving. It is best to replace the pads once in two seasons at minimum. The ideal season to replace the pads is at the start of summer season. Poor quality of water is the major cause why the pads get damage. Make sure also that you clean the belts and that it is free from cracks when you also inspect the pads. 3.) Then, you clean the water tank. When your area uses hard water, this procedure is very essential. Inspect if the water level, while the unit is working, if it’s too low or high. If it’s not equal you can correct the water level by adjusting the float valve. Low water makes the cooler not to work on its maximum level while having too much water will result to water leakage. 4.) Check the swamp cooler parts if they produce proper air ventilation. Make sure that there is adequate air circulating to keep the humidity continuously producing and also the temperature outside the unit. 5.) It must have proper storage. The air filter and the pads must be removed before you can store the unit. Make sure that you have drained and dry the tank from water. Find a place that is dry and far from the foot traffic. You can store back the unit to its original back in times of winter season. Most swamp cooler machines in the market are of high quality but it does not mean that they will not need swamp cooler replacement parts. The outlet where you bought your evaporative cooler is the ideal place to look for swamp cooler parts, as it will allow you to get the exact components that you need. This is important since most brands will need specific parts to work efficiently. Thus, if you have a Champion evaporative cooler, you should look for Champion swamp cooler parts. If you have a Mastercool, limit your search to Mastercool swamp cooler parts only. If a particular part is not available, you can turn to online retailers that could be selling the product you are looking for. The main swamp cooler parts are the cooling pad, pump and fan. The difference between the temperature of the air before it goes into the cooler and after it exits it measures the efficiency of the swamp cooler, and the swamp cooler part that has the biggest influence on this factor is the cooling pad. Cooling pads are usually made of cellulose or cedar shavings. One of the most vital swamp cooler parts, the pump circulates water inside the evaporative cooler, driving it through pad to be cooled down. For the water to remain cool the pump has to circulate it continuously much like in a car radiator. A swamp air cooler is basically a big fan walled in by cooling pads inside a large frame similar to a box. The fan drives hot air outside into the pads, allowing it to cool down by as much as 30 degrees, as it evaporates molecules of water from the pads, which are continuously wetted down by the pump. The fan then drives cooled air through the room and out a vent. There are people who will look for comfort from the indoor air conditioner every time it gets hot. But eventually there are certain buildings and apartments who may find air conditioning difficult. That is why they take refuge to the portable swamp cooler. Both can serve fine temperature in the environment but when it comes to cooling techniques they eventually differ from each other. The best about air conditioner is that they are good in a place where the air is continuously circulating. As for swamp cooler, they are best in a place where it only needs to supply air and increase cooling effect. Whatever types you like to choose for you house or building, it is essential that you must know the right equipment for you. What type you choose will depend on the climate of your place, the cooling needs of your environment, and the energy concerns you have when it comes to electric bills. Without dealing on the type you permanently install, the air conditioner gives you full control over the indoor temperature. It’s good in producing a supplemental cooling effect to any existing air conditioning unit. It is also good for those places that do not allow permanent window units. This type of air conditioning comes in a compact size where you assemble it with a host running outside. The swamp cooler parts of the system save you half the house energy bill. It is the most cost-effective when it comes to staying cool all the time. Uses only the simple process in evaporation to produce cooling effects. The versatility of this cooler is another reason to own this one. It is studied in the United States that using air conditioner can consume up to 5 percent of the electricity which cost all homeowners for about 15 billion dollars. But since swamp cooler uses evaporation, it is likely that they consume 75 percent less of electricity than the air conditioner. The swamp cooler parts consist of walled-fan and water soaked pads which lower the temperature of about 20 degrees. If any case you choose the swamp coolers, there are also considerations to make. If you are only cooling some parts of your home, personal air cooler is great. But if you are going to cool warehouses, entertainment venues, and stadiums, the commercial swamp coolers are the best.